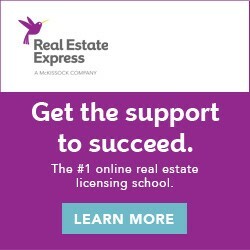 Are you wondering where you need to go to get your real estate license? If you are ready to get started, then you’ll need to take the required real estate courses for your state. Getting the proper and necessary training is the first step to becoming a real estate agent. One of the most important things is to make sure you take your courses through an accredited real estate school. Look for ARELLO & IDECC approved real estate courses to know you are getting the best education possible. Which Accredited Real Estate Schools Do You Recommend? There are a lot of accredited real estate schools to choose from. Make sure they are approved by ARELLO and IDECC. Other than that, choose the format you like best. The information delivered is designed to do one thing, to help you pass your state real estate exam. You can either take classroom courses or complete your required courses online. Not all states have online real estate courses, so you may need to look into taking the courses from your local community college or school. Keller Williams has its own recommendations for initial real estate courses for anyone interested in obtaining a real estate license. Check to see if there is a Keller Williams real estate school in your area. When you see the ARELLO (Association of Real Estate License Law Officials) seal, you know the real estate course provider has gone through great lengths to provide you the best learning experience available. The #1 task of ARELLO is to equip members to fulfill their role as regulators so they can properly administer licensing laws that protect public interests. IDECC (International Distance Education Certification Center) is a program overseen by ARELLO. It is an internationally recognized certification that validates delivery and design of distance education courses. The mission of IDECC is to certify and promote quality education using comprehensive distance education standards. Getting your real estate license isn’t difficult, but it is the first step to a rewarding career in real estate. In order to practice real estate, it’s essential you have your license. It’s illegal to represent yourself as a real estate agent without a license. If you are convicted of such a crime, then you’ll won’t be allowed to acquire a license in the future. Do your due diligence. Get the required licensure from an accredited real estate school before you start helping others buy and sell real estate. Either way you go about getting your real estate license, we still want to have the opportunity to share our unique interdependent business model with you. Don’t just survive, thrive! When you join Keller Williams Realty, you are joining a community of mutual support and ongoing education. Becoming part of the Keller Williams family means having access to the countless course offerings of Keller Williams University and on-demand training through KW Connect. Ongoing education takes up where bare bones licensing training leaves off, giving you the skills you need for effective lead generation and marketing. Both are critical for a successful real estate career. New agents can also take advantage of Ignite, the real estate training system that helps agents think strategically about how to take their business to the next level. Keller Williams Realty is the #1 real estate company in the world for a reason. More agents are joining KW than any other real estate company because of our excellent training/support, cutting-edge technology and family-like culture. See if KW is the right brokerage to partner with in growing your real estate business. Contact us today!